I read it somewhere yesterday on Facebook after Asia Cup Final between Pakistan and Bangladesh and it looked completely true to me "It's happening first time in Cricket that the winning country is sad for the losing country." Last night Pakistan Cricket Team won the Asia Cup final from Bangladesh after a close match by just 2 runs after which Bangladeshi players became emotional and tears came out of their eyes. Although People of Pakistan where happy on becoming Asian Champions but they also looked sad on defeat of Bangladesh. 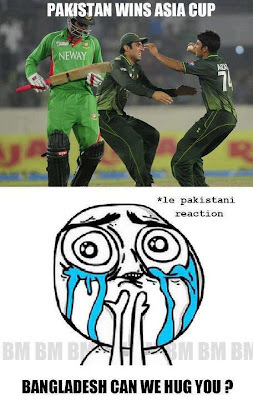 Most of Pakistani Facebook Pages and Users showed their appreciation for Bangladeshi team the way they played. They where also sad to see the tears in eyes of Bangladeshi players. Truly perhaps it has happened for first time in history of Cricket that the winning country became sad for the losing country.